For a battle that we know nothing about, some stuff is at last starting to come out of the woodwork about Chalons ( a lot of it on the SoA forum page http://soa.org.uk/sm/index.php?topic=217.0). Firstly there is Jordanes, who tells us who was fighting on each side and about this enigmatic ridge. His numbers are obviously incredible though, and that’s a problem when you are trying to wargame a battle using rules that have a troop ratio. Second is a panegyric of Sidonius that tells us that Aetius came north with no milites, only auxiliaries. 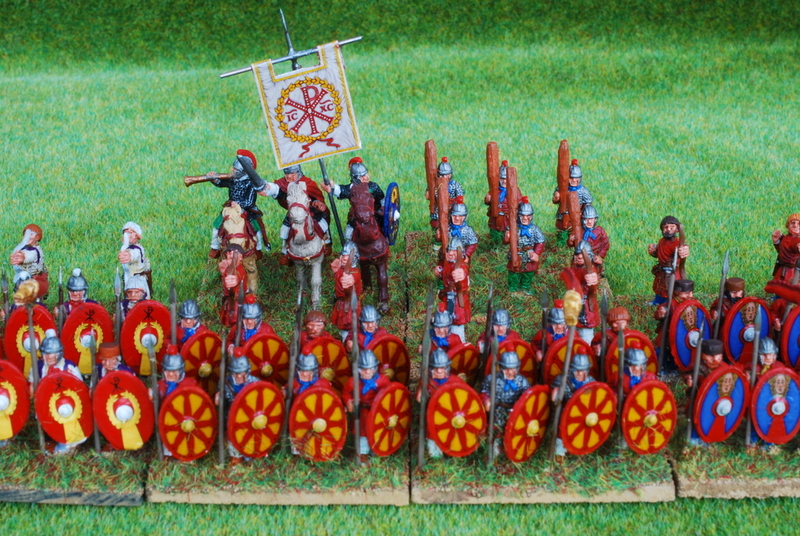 Some interpret that as no legions, just auxilia; others more broadly as being no regular Roman troops, just mercenaries or household. Thirdly, we have the record that the Vandals (and some Alans) when they crossed into Africa under Gaeseric were counted and numbered 80,000 people in total, so we could guess than only 16-20,000 of those would be men capable of fighting. This is accepted as a reasonable figure for a Germanic host of the Volkswanderung period. Fourth, Duncan Head has mentioned a argument of Lindner that Hungary at the time of Attila couldn’t have supported the horses for more than 15,000 Hunnic cavalry. Impressive run out for the Marians at the weekend – two wins and two winning draws. I think I have finally cracked the right about of berserk aggression to cope with an army that is so tough yet so small. You need to be very cavalier about casualties on the hinge command as well. Full battle reports to follow (need to copy them from the Yahoo group). I seem to be in a strange position with the Ikea website. For reasons that I can’t fathom, it is geo-locating me in China, so I am seeing all the prices in Yuan. In addition, I can only see stock levels in Beijing, Shanghai etc, rather than Wembley which is easier for me to get to. I’ve deleted all my Ikea cookies, but that hasn’t fixed the problem. And what distinguishes the Ikea website from what we could call well-written websites is that there is no manual over-ride for their geo-location. They are so confident in it that they don’t bother to give you an option to set it yourself. Which seems to be the default position these days. I think that I may have to ease up on the figure painting until it gets better. This is a close up of a figure that I put a photo of up in a previous post – at the time that was the best reproduction ratio I could get. This was done using my 35mm f2.0 AF-D on my D80 with the PK-12 and PK-13 tubes together. Because the D80 doesn’t have the old external coupling the camera can’t read the aperture that is set (and I have to use one of the proper non-G lens because that way I can still set the aperture manually) so I have to go fully manual, and the metering doesn’t work either because there are no electrical contacts, but its easy to just take photos in digital and look to see what the exposure is like. There is the internal coupling though so I can at least focus without the aperture stopped down. All in all, very satisfactory – certainly that is close enough so see the paint job brush stroke by brush stroke. 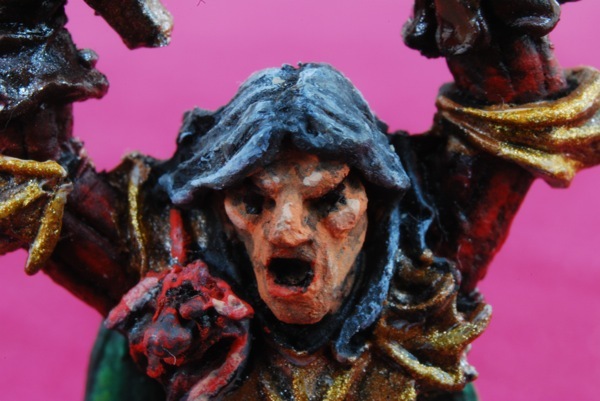 Very few postings recently because I have been doing so much painting for the Society of Ancients Battle Day, but the day has almost dawned so tonight will just be the last couple of finishing touches. 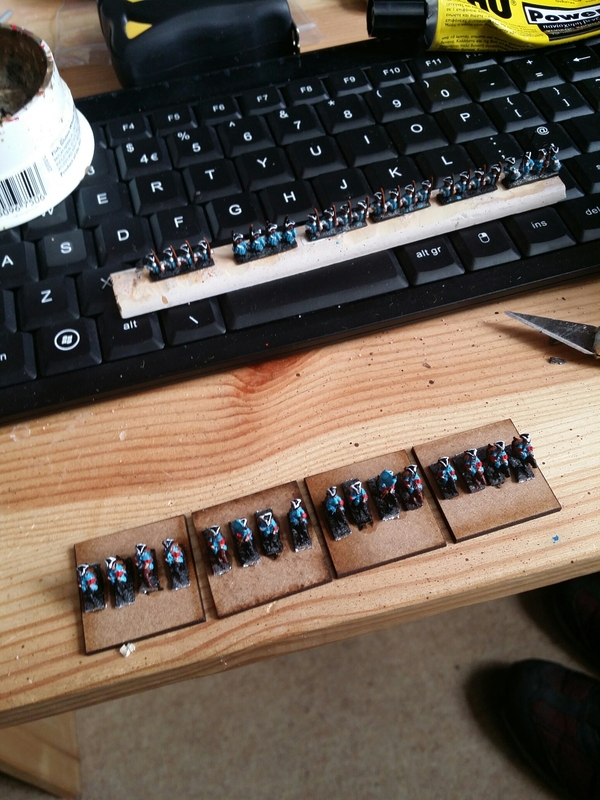 Here the army is, lined up against the Carthaginians they will be playing tomorrow (my Romans are the fuzzy ones facing you in the distance). Went to see the new series of the IT Crowd being recorded on Friday night, courtesy of an old schoolfriend who used to work with the guy who provides a lot of the props for it. I have never seen a more geek-oriented audience, which I guess is hardly surprising. The most amusing part though was a couple of guys sitting behind us who seemed to regard it less as a sit-com and more as a sort of workplace Changing Rooms – they were running through all the posters on the walls and deciding which ones they wanted to add to their office. Why is it that whenever I open a pack of tablets that has a piece of paper in it with the instructions, I always open it at the end where it is folded around, so you can’t get at the pills?